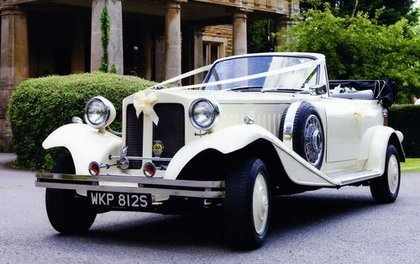 This is our gorgeous Beauford tourer - and as you see, the hood folds down! 'Penny' - as she is affectionately known, offers 1930's style with the reliability of modern mechanical engineering. Diana is a luxurious 7 seater Daimler limousine in black over old English white. Perfect for getting all those important members of the wedding party to the ceremony in classic style. Of course, Diana also makes a beautiful wedding car in her own right, too. Dolly is also a luxurious 7 seater Daimler limousine in Ivory white. Perfect for getting all those important members of the wedding party to the ceremony in classic style. Of course, Dolly also makes a beautiful wedding car in her own right, too. Why not spoil yourself and have two? Our service also includes complimentary bubbly (alcohol free if you wish) for your photographs on arrival at the reception venue. Both cars carry large umbrellas - just in case the British weather decides to not play along! Please note - discounts are available for single venue ceremonies - arrive in style for your big day! Contact us for futher details.